Large 2″ + drain at bottom of conical is the best yeast eliminator we have seen. Recirculating in the mash tun! Recirculating in the mash tun! For my home brewing mash tun I use a Blichmann 20 Gallon Boiler Maker Brew Kettle with the Blichmann false bottom. I use a home brewing march pump that then recirculates my wort through a digital RIMS unit that I made which maintain the mash temp for me. Since I am brewing in a stainless steel kettle and not an insulated cooler, I need to regulate the mash temperature. During the 60 minute mash process I constantly have the wort circulating which helps clear it as well as boosts efficiency by circulating the hot wort (typically at 151F ) over the grain bed. I use the MoreBeer Ultimate Sparge Arm for my wort recirculation . Is is the best sparge arm that I have ever used and never jams up! 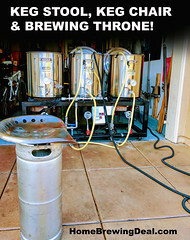 Coupon Code Description: Today Only at MoreBeer.com you will save $40 on a copper counter flow wort chiller with More Beer promo code BEERDEAL. MoreBeer’s copper convoluted counter flow wort chiller called the Chillus Convolutus Wort Chiller, comes with threaded 1/2″ fittings built in! They are on both the in and the out making connecting with pipe fittings, quick disconnects or even tri clamp sanitary fittings a snap. 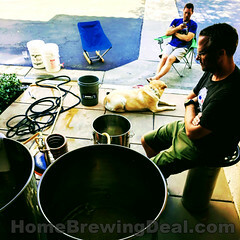 This is the same home brewing wort chiller that I use on my home beer brewing system and it works like a charm. 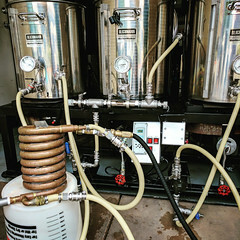 I have used immersion wort chillers and plate chillers; this chiller is by far my favorite because of how fast it chills, how easy it is to clean and how compact it is! The inner tube in this counterflow wort chiller is made from 12 feet of 5/8″ convoluted copper pipe that is constantly chilling the wort against the 2nd outer channel tube as the wort flows through. 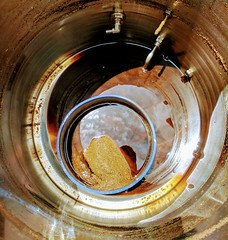 The outer tube is made from 7/8″ copper, making for an incredibly efficient wort chilling solution! Small footprint makes them easy to store – take better advantage of the space you have to dedicate to beer brewing. Heavy duty handles make these tanks easy to move, even when full. Comes with a FREE spigot and oversized 2-piece Speidel airlock!